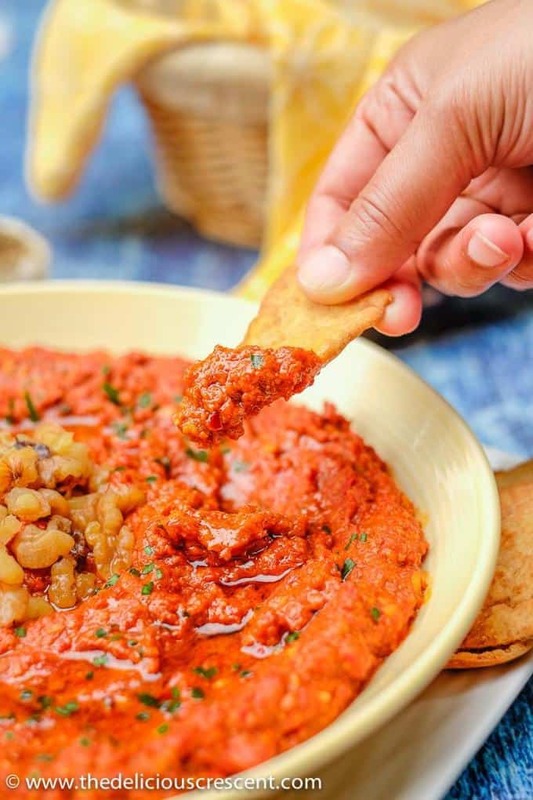 Muhammara is a finger licking tasty red pepper dip from Syria that is so healthy and easy to make. Packed with flavor and nutrients, this requires few ingredients. Use it as a dip, sandwich spread or to top flatbreads. Muhammara is a hot red pepper dip, said to have originated from Aleppo, Syria and now popular in Levantine and middle eastern cuisines. It is made with red peppers, walnuts, bread crumbs, pomegranate molasses, lemon juice, cumin, Aleppo red pepper flakes, garlic and olive oil. It is great as a traditional dip with pita chips. But I also love it on plain sourdough or French bread. And fantastic with a little bit of cream cheese on bagels. 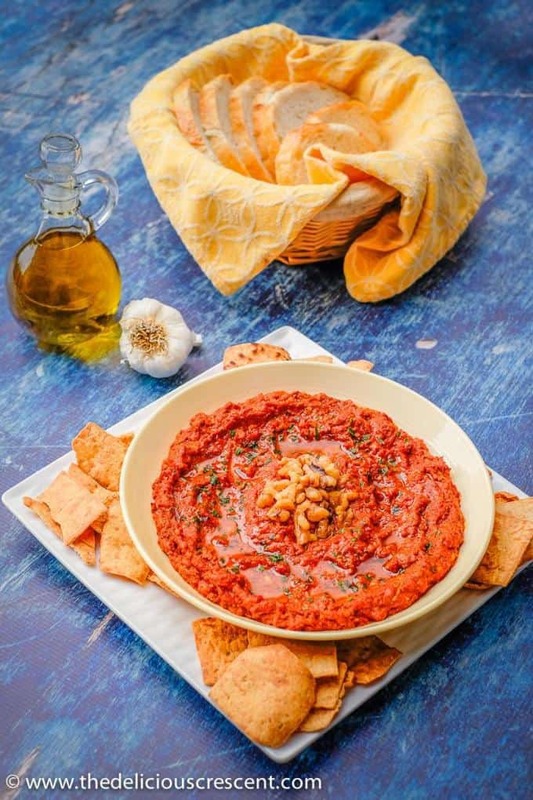 Traditionally muhammara is sometimes spread on flat breads to make something similar to manakish, the flatbreads made with zaatar. 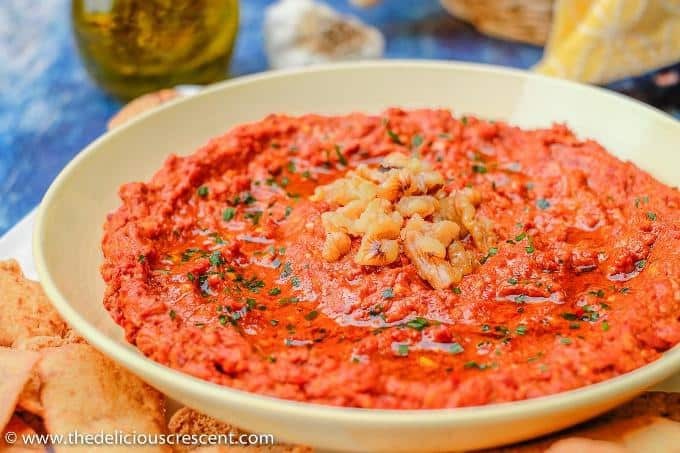 Muhammara is a delectable nutrient dense dip. Full of omega-3 rich walnuts, it offers plenty of heart healthy fats. The peppers used for muhammara are a rich source of carotenoids, vitamin C and antioxidant nutrients. The other condiments used in the recipe further elevate the taste and nutrition profile of the dip. Incidentally I met a fine lady from Aleppo, Syria after I made this recipe. I excitedly mentioned to her about my recipe preparation and she shared with me several tips and experiences while making this dip here in the US. She mentioned that she processes the red bell pepper pieces through a meat grinder and spreads it in a layer on a baking sheet and roasts the mixture in the oven. The juices collected while grinding the peppers are separated and concentrated in a sauce pan over the stove and added back to the ground red peppers and mixed. Large batches of this mixture are portioned and frozen to use as needed. In Aleppo, ground red peppers are sun dried and stored for use in winter time to make Muhammara. So she has found that the above method was the closest approximation for having a quick and ready source to make her favorite dip from Aleppo. Use bright red and firm peppers. I roasted and removed the skin, since the bread crumbs and walnuts add texture. However, you can also skip the step of removing the skin except for the charred areas. Adjust the quantity of lemon juice, pomegranate molasses or even cumin and garlic to your taste preference, if needed. 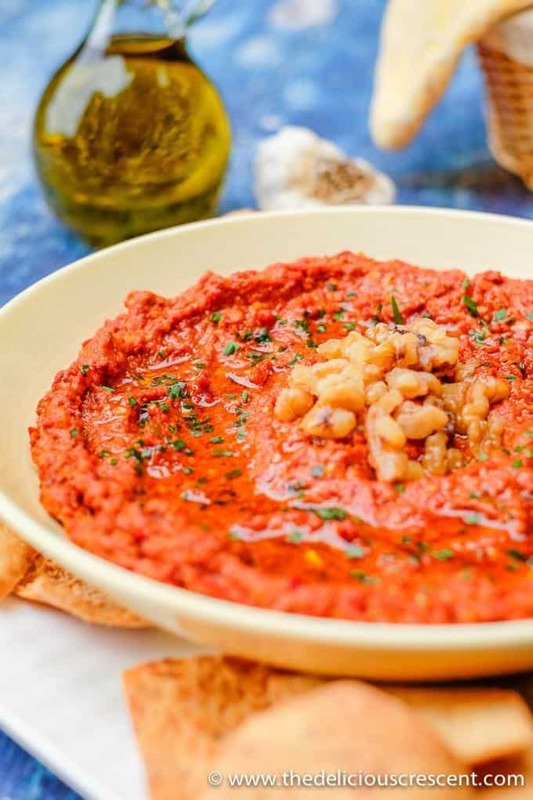 Muhammara is traditionally made using mortar and pestle and has a slightly coarse texture. So stirring finely chopped walnuts in the end will give you that texture. You may however, make it as a smooth dip if you prefer. Using only the pulse action in a food processor helps retain a slightly coarse texture and prevents the mixture becoming too smooth. One secret ingredient I used is readymade Turkish red pepper paste, which gives a nice deep flavor, texture and color to muhammara. It is available as hot or mild paste. And the lady from Aleppo told me that she does the same too! If using the Turkish red pepper paste, you may need to adjust or skip using the red pepper flakes or it may become too spicy hot. Nut Free: Replace walnuts with sunflower, pumpkin or hemp seeds. Other Options: Some people use tomato paste to add a bright color and smooth texture and/or to replace the sweet tangy pomegranate molasses. I always have the muhammara ingredients handy, so I never use tomato paste and personally prefer the traditional ingredients. Readymade roasted red peppers may be used to substitute fresh peppers if necessary. ★ Did you make this recipe? Please comment and give it a star rating below! Tag a photo of your creation at #thedeliciouscrescent on Instagram. Join me on Pinterest, Facebook, Twitter, YouTube and Google+ for latest updates. 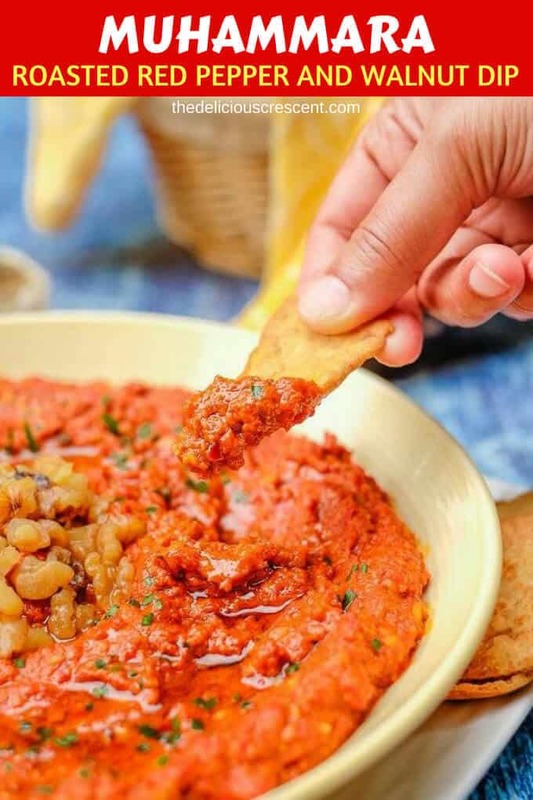 Muhammara is a finger licking tasty red pepper dip from Syria that is so healthy and easy to make. Packed with flavor and nutrients, this requires few ingredients. Use it as a dip, sandwich spread or to top flatbread. Preheat the oven to 425 degrees F. Place the red bell peppers on a parchment paper lined baking sheet and roast for about 35 to 45 minutes. Turn the sides of peppers at least once, and roast until they are soft, well cooked and the skin is charred. Transfer the roasted bell peppers to a bowl and cover with a cling wrap. Once cooled, peel the skin and remove the seeds. Cut the roasted peppers into strips or pieces and place in a food processor. Add the bread crumbs, lemon juice, pomegranate molasses, red pepper flakes (if using, see note), cumin and grated garlic. Use the pulse option on the food processor and process the ingredients into a slightly coarse but cohesive mixture. Next, add finely chopped walnuts, Turkish red pepper paste (if using, see note), olive oil, about 1/3 tsp salt and pulse it again to combine well. Adjust the amount of pomegranate molasses, salt and red pepper flakes to your taste. Transfer the muhammara dip into a shallow serving bowl and use the back of a spoon to create some curvy patterns. Drizzle some more olive oil. And garnish with chopped fresh mint or chives and some walnut halves. I love healthy dips and have tried a lot of them, but I’ve never tried this! It’s next on my list! This looks so yummy! I love red peppers and Middle Eastern cuisine, but I’d never heard of this dip before. This looks great! I love having a broad variety of snacks for football game day- this is going on the list! Thanks Katie. Hope you have a great time watching the games. The secret ingredient!!! So very true! What a wonderful recipe from Aleppo! This is delicious. Thank you for your lovely feedback :) Appreciate it! What is ur fb page? Sorry about that. I will update that soon. Right now away but will be able to update next week. You can access the social media icons from this website on the upper right hand side and also on the home page lower left hand side.